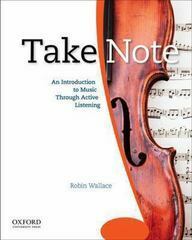 Take Note 1 Edition Take Note: An Introduction to Music Through Active Listening is an innovative music appreciation text, designed to help students become active and attentive listeners through an in-depth examination of a recurring repertory of core musical works. By exploring each element of music through the lens of these core works--which were carefully selected to represent a variety of styles and genres--students deepen their understanding of how music works and develop strong listening skills that will enhance their enjoyment of music. Combining this listening-centered approach with an overview of Western music history, interactive activities, and in-text features that invite students to discover additional works outside of the classroom, Take Note prepares students for a lifetime of music appreciation.Distinctive features* Listening-centered approach: develops students' understanding of the basic elements of music* Recurring core repertory: explores the elements of music through a select group of musical works that reflect a variety of styles (piano, winds, brass, and percussion) and genres (jazz, lieder, world, and choral music)* Historical context: gives students an overview of Western music from the Medieval period to the present through a 3-chapter historical survey, timelines, and "Focus On," "In History," and "Across the Arts" boxes* "If You Liked This Music" boxes: encourages students to expand their playlists and listening skills beyond the core repertory by offering additional listening suggestions throughout the text* Dashboard for Take Note: offers streaming audio of all of the musical selections in the text plus instrument videos, activities, and interactive listening guides that provide moment-by-moment explanations of key works through a running commentary. Save money by purchasing a new book bundled with a Dashboard access code or purchase Dashboard separately at www.oup.com/us/wallace.